HISTORY’s series Vikings shows viewers what it was like to be a Scandinavian seafarer during the Middle Ages. With its campaign at San Diego’s 2014 Comic-Con, the cable network and Civic Entertainment Group let attendees experience what it’s like to be an actor on the series. To register, conference attendees created a character profile on a custom iPad app as well as inputting personal data for their “cast page.” In return, they received a credential badge and a QR code to be scanned at Vikings stations throughout the convention. At the first station, they were professionally made up, complete with fake blood, scars, and Viking-appropriate grime. Next up was wardrobe and armory. From there, participants headed to a green-screen booth, where they posed for an official series poster. Not only did they receive a print copy of the poster, but the Viking wannabes also received an image texted to their phones, ready for sharing via social media. Participants subsequently posed on an authentic Viking ship set against a stormy sea background. Now that they were warmed up, the participants were filmed acting out a village raid scene, where they were encouraged to improvise to their gruesome heart’s content; impalings and beheadings were among the popular scenarios. Footage was then dropped into a 30-second Vikings promo trailer that the “actors” could view immediately on their iPads. These videos were also emailed to the participants, along with their profiles and behind-the-scenes photos, as well as embedded on HISTORY.com. As if the poster, video, and photos weren’t souvenirs enough, the network also gave participants a custom drinking horn. 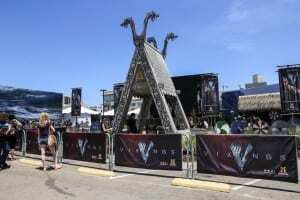 Fans who brought the horns to participating bars in San Diego could receive half-price beers; the bars had prominent exterior signage promoting the campaign, which helped spread the word beyond Comic-Con itself. During the three-day Comic-Con, 2,219 attendees registered for the experience, resulting in more than 10,000 social posts generating more than 150 million impressions. What’s more, the campaign featured in more than 220 articles in publications ranging from Adweek to Rolling Stone. And not a single village was pillaged in the process.